Whole Foods can drop the “conscious capitalism” shtick now. With its sale to Amazon, Whole Foods must finally give up its do-gooder image. 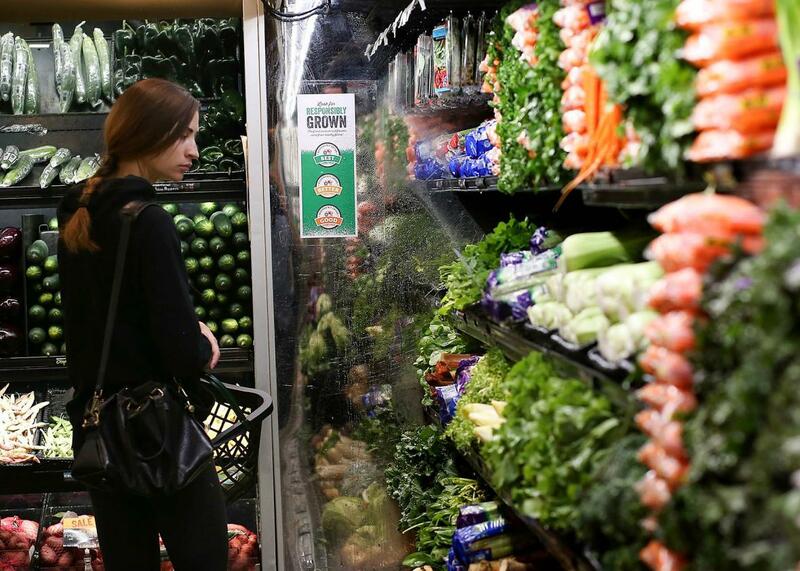 A customer shops at a Whole Foods Market on Oct. 15, 2014 in San Francisco. Yet just two months later, Mackey is selling his baby to Amazon for $13.7 billion, a dramatic denouement for a company that is deeply rooted in the hippie counterculture of the 1960s and ’70s. Since its founding, Whole Foods has made its name bucking corporate conventional wisdom—even as it has come to epitomize the massive, often mercenary contradictions of Big Organic. The company sold organic foods long before any major supermarket chain thought it was worthwhile, and it’s thrived in part by defying the grocery industry’s insistence on centralized distribution and standardization. Now the organic supermarket pioneer will be owned by one of the most brutally efficient and standardized retailers in the world, a company with a relentless focus on selling things cheaper and faster. But perhaps more significantly, it signals the end of a dream for Mackey and Whole Foods, and even for the entire organic food business. With more than 400 locations, Whole Foods has long ruled the organic marketplace. But unlike any other national retailer, it claims to be rooted in environmentalism and the hippie movement of the 1970s. It’s not that Whole Foods didn’t care about profits. Mackey has long contended that Whole Foods began as a company seeking to “make our country and world a better place to live” by recognizing “human rights, food safety, and environmental deterioration were major concerns.” But with its sale to Amazon, a company with a poor environmental track record, questionable labor practices, and limited experience selling organic food, Whole Foods has lost any credible link to its countercultural roots. Whatever Whole Foods will be able to say about itself now, it will be much harder for it to maintain its do-gooder image. The modern organic food business started as a cottage industry of longhairs selling brown rice and tofu out of wooden barrels in small stores. In 1978, Mackey and his then-partner, Renee Lawson Hardy, launched one such store, a vegetarian grocery in a two-story house called SaferWay. The name spoofed Safeway and indicted the environmental dangers of supermarket chains’ reliance on large-scale agribusiness and wasteful production methods. Two years later, Mackey merged the store with a competitor to form a new business he and his partners would call Whole Foods Market. In the next decade, the store expanded throughout Texas and into other states, and by the start of the ’90s, it had become the highest-volume seller of organic food in the country. Whole Foods’ growth was rapid. In 1992, the company became the first ever publicly traded organic foods retailer. The organic food marketplace transformed into a major industry with Whole Foods at its helm. Yet Mackey and Whole Foods insisted their company wasn’t only interested in profits. The company’s “Declaration of Interdependence,” a mission statement of its core values, contains sections on “Team Member Happiness” and “Environmental Stewardship.” With missionary zeal, Mackey has devoted himself to promoting “conscious capitalism” in a popular 2013 book by that title and in a series of CEO summits he organizes. Mackey’s politics haven’t always aligned with Whole Foods’ stated values of conscious capitalism, of course. In recent years, he’s speciously criticized the Affordable Care Act as fascist, and he’s also remarked that climate change “isn’t necessarily bad.” And for all its public statements endorsing employee satisfaction, Whole Foods has long opposed workers’ efforts to unionize. Yet Whole Foods remains one of the most environmentally responsible retailers in the country, ranking highly on a variety of sustainability metrics. Whole Foods also offers its employees some unusual freedoms. Individual stores and their departments have considerable power to make purchasing decisions, and local managers enjoy a level of discretion unheard of at most chain stores. Employees have major input in hiring and get to vote to approve or reject new co-workers who’ve completed a trial period. Despite Mackey’s libertarian leanings, Whole Foods sets itself apart from other chains through these practices. Will Whole Foods be able to retain its distinctive culture once this deal is finalized? While Amazon says it wants to keep Whole Foods as is, it’s impossible not to wonder how Amazon’s corporate culture might rub off, especially as the store struggles to compete with other sellers of organic products such as Trader Joe’s, German discounters such as Aldi and Lidl, and even Walmart and conventional supermarkets. While deeply objectionable, Whole Foods’ efforts to discourage unionization seem timid in comparison to Amazon’s proud endorsement of “unreasonably high expectations” with uncompensated overtime, combative meetings, and encouraging employees to anonymously report each other’s mistakes to management. Working conditions in Amazon’s shipping facilities appear just as bad, if not worse. It seems unlikely that Amazon’s cutthroat managerial approach will tolerate Whole Foods employees’ long-held freedoms and team leaders’ decentralized autonomy for long. The sale also jeopardizes Whole Foods’ devotion to environmental stewardship. Amazon’s Web Services subsidiary is one of “the dirtiest and least transparent companies in the sector, far behind its major competitors, with zero reporting of its energy or environmental footprint to any source or stakeholder,” according to a 2014 report by Greenpeace. If Amazon doesn’t value sustainability, will it accept the considerable expense and effort that Whole Foods devotes to environmental stewardship? After six consecutive quarters of losses, Whole Foods had recently begun to make its own changes in the composition of its board and executive team. But such changes are trivial compared to being swallowed by the world’s largest online retailer. With its relentless efficiency standards, Amazon is poised to radically transform not only the pioneering organic chain but the entire brick-and-mortar grocery business. Whole Foods may have been John Mackey’s baby, the object of his affection he raised from infancy. But once this sale is completed, Amazon will be its legal guardian and Whole Foods will be the online retailer’s stepchild. Mackey and Whole Foods’ already debatable claims of “conscious capitalism” now seem even more dubious.